What a treat to see these two comedic icons. Unfortunately there was a no-photo request made prior to show so the above shot of the stage was all I could get. 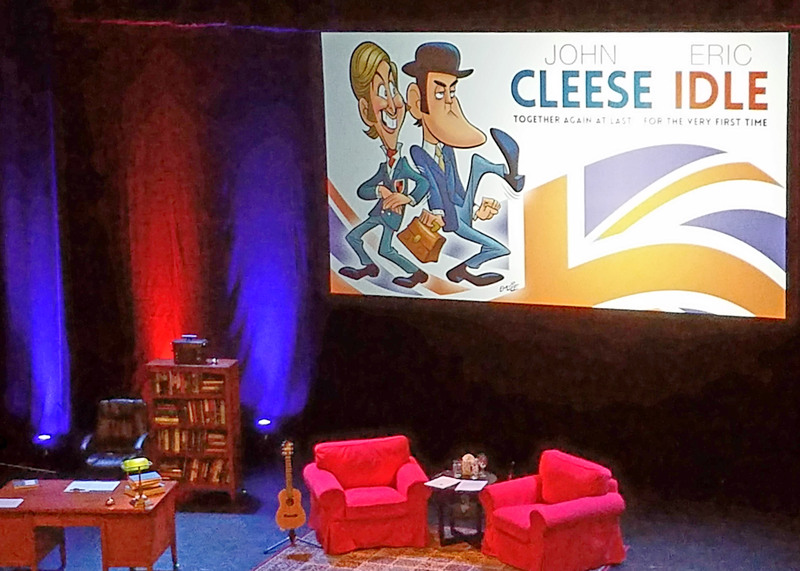 The show was arranged in a chronological walk through the history of the guys from their early college days, through their first meeting up with the Monty Python group through the early BBC days and into the movies and to the current days. They told a ton of fun stories and shared many happy memories for themselves and the audience who had grown to love them throughout the years. My favorite part of the show were the songs…Eric Idol just has an incredible way with putting lyrics together in such a way that no matter what the song is about, you just have to bust a gut laughing. Not sure if was just because of the hour and a half of other hysterically funny material, but when they performed a song called F**K Christmas I just busted a gut laughing.. I mean, a couple of 73/77 year old men on stage singing these lyrics was just hilariously funny. They also didn’t disappoint me and played what I was really hoping they would and that was the song Always Look on the Bright-side of Life from my favorite film of theirs Life of Brian.